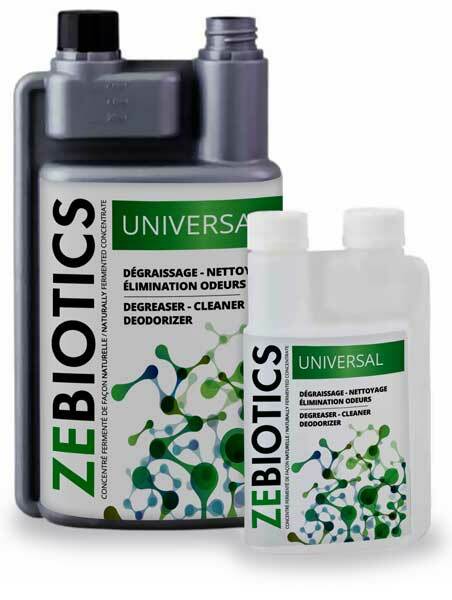 ZE BIOTICS® is a naturally fermented concentrate, containing effective micro-organisms and cultures, which dissolves grease and cellulose. USE: Elimination of odors and cleaning. Dosage : 25ml /5 l ( 0.5%) . Remove the graduated filler cap. Fill tank by slightly and constantly pressing on the bottle body. Pour the tank content in the water tank of the Zelup® Gun. Repeat this process until the required dosage is reached. INGREDIENTS: Lactic and phototrophic bacteria, yeasts and micro-organisms for the hydrocarbon degradation. STORAGE: Store in a cool, dry place (+8 +18°c) away from light and electrosmog. Do no store in the refrigerator.